It just so complicated and featureless. Even if you are a master in it, you still cant compete to a beginner using Solidworks/Inventor. Why lurking in an OpenScad user forum when preferring real programs ? I can only speak for my self: I have trouble visualizing my goal and manipulating primitives by mousing them around on a 2d screen that simulates a 3d space.. I can, however, visualize primitives in my head and place them in relation to each other by the absolute coordinate system of OpenScad. luckily, the limits of my intended designs are not even close to the limits of OpenScad functions. But for other people the selection criteria probably are very different. If you are a programmer it isn't complicated, it is a very simple language. It also free and open source. Because it is text it can use software source control like GIT and then people can submit patches to designs and collaborate on open source projects. You can't do that with Solidworks / Inventor as everybody would need licences and patches and merges are difficult when the model is not stored as text. It runs on both windows and linux. My main family PC runs windows 7, and I do a lot of designing there. My printer though is controlled by a Linux PC. I do some designing there, and a lot of tweaking. I need it to run in both environments. Let me echo too, that I like being able to represent by object by exact mathematical formula. Although I've been working on computers for over 30 years, I have thus far been unable to crack the nut that is learning a good CAD package. OpenSCAD just fits with me. Well like I said im just curious as for why people are using it. I also happen to be Dutch so Nice blog! I happen to have a camper van myself too. Only its an old Volkswagen t3. Indeed the code doesnt look that hard. But it does seem kinda slow and cumbersome to model this way. I think you can still use GIT for models created by Solidworks and the likes. Then again you could also do this with a simple dropbox account or a 10k$+ PDM system and design a machine containing 100's of parts with 100's of people. Jup it doesnt work on Linux. 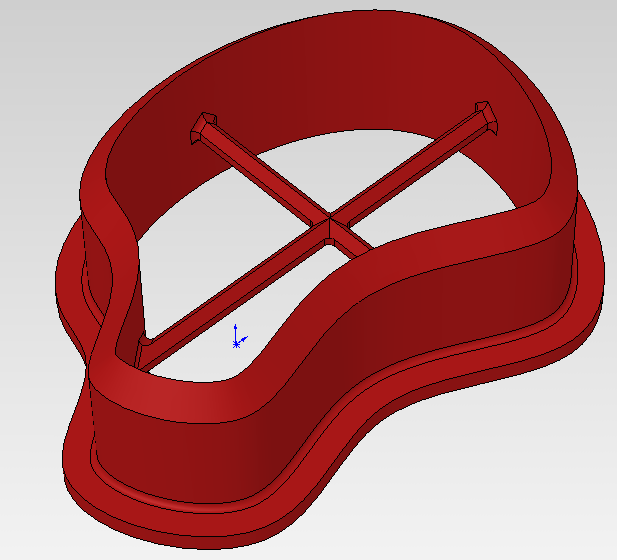 I used some other 3d programs for nice applications (Finite Element Analysis/Mould design). But in the end I cant image anyone using something that isnt parasolid or similar, based for 3d precision modeling. Just the speed and complexity you can get is still unmatched. Its however a bit harder to get into. Anyways I get why its being used here now. Its easy and fast to get into if you have little CAD experience. And quite powerfull at the same time. Take a look at how you can import a DXF file and create 3d model easily. Not very practical in a 3D cad program. I dont know, you can do that easily in just about any CAD program. Same with importing and exporting DXF files. Look a little closer at what that does. It isn't about importing a DXF, yes anything can do that. It will import a DXF file, then based on the layers in that file, create a printable object. It extrudes the three different layers independantly and you can create some pretty cool stuff. All with a single scad file. Yeah its quite cool you can to that. But its not unique to that cad program. So its like adding a few planes x distance appart and parallel to eachother in a 3d model.Then importing DXF's onto each plane as a sketch. And then extruding each sketch from each plane.? Nophead's excellent Mendel90 is modelled entirely in OpenSCAD. The benefit of doing this is that if we want to scale the model then all we have to provide it are the dimensions of a few basic components - the heated bed, the motors being used, the diameters of the steel rods, etc. The ENTIRE model is then redrawn with the correct dimensions, holes, etc, plus it produces a bill of materials to boot. That's a pretty powerful feature for anybody wanting to produce scalable parametric designs for actual objects without having to start over each time a small component changes. If it appears slow and clumsy then you're probably using it to do something for which a better tool already exists. Say I have a steel rod of ∅5 and I want the hole in a plastic holder to be ∅5.5 than all you have to do is drag a dimension from the hole to the steel rod and add 0.5. This way the hole will always be 0.5mm larger. You can also insert equations like you always want to have the hole 10% bigger than the rod instead of a solid 0.5mm. This way if you change the steel rod model all dimensions in the whole assembly get changed. In big model assembly's you can lose overvieuw like this, so you have a design tabel (Excel) that holds and dictates all measurements in a model. In here you can have drop down lists for example different rods or stepper motors which change the whole model if you select them. I dont expect a free tool to be better at this than a 6000+$ CAD program, but as far as I see ist the fact that its: free, small, runs on Linux, and easy to get into are its best parts. I doesnt really have any unique modeling features that arrent done better in other CAD programs. Put another way, why would I spend all that money on a commercial tool to do the same job that a free tool does perfectly adequately? OpenSCAD is a tool, and at the moment it meets my purposes. I didn't have to fork out any money for it and I can readily reuse my existing skills in writing C style code. When the day comes where I'm struggling with the limitations of OpenSCAD then I'll go find another tool. The benefits of that tool will have to outweigh the learning curve I would need to overcome to use it effectively. Incidentally I already use Sketchup for other things but it was the limitations I found in that which sent me looking for another tool - which is when I found OpenSCAD. 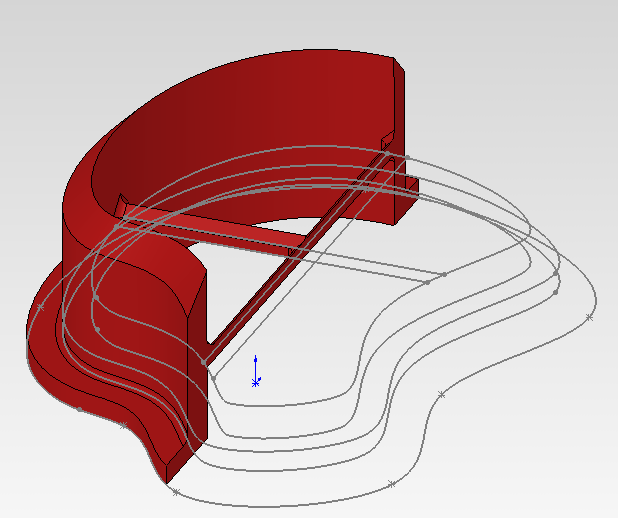 Sketchup still has its advantages in many situations, but I prefer to use OpenSCAD just because it matches the way my mind works - in the same way I'm guessing that a graphical interface like Solidworks matches the way your mind works. Uhm okay just to the learning curve and the price: I am an trainee and got a free licence for all autodesk products on autodesk studens. - and that legal. after that I got 2 lessons that took about 4 hours i was able to model all i wanted including stability calculations etc..
Edited 1 time(s). Last edit at 04/11/2014 09:19AM by forreason. Yes like I said its: free, small, runs on Linux, and easy to get into are its best parts. So I get why people are using it. We all know how easy it is to get acces to Solidworks/Inventor etc for free. The reason I prefer OpenScad to GUI based CAD programs is that it is parameter driven. I can code a part where the size and position of all parts are driven by the values I assign to variables. In all GUI CAD applications I have used, making a small change to the dimensions of some feature of a design can involve a pretty major re-work, because that dimension affects other parts and the GUI programs do not automatically adjust the rest of the design. In OpenScad I can make one "master" design of (say) a lens cap, and simply enter the values of lens diameter, wall thickness, wall height and wall draft (the inward angle that allows the cap to grip), and I have a custom lens cap to fit any camera I might come across within seconds. I can even write code that will adjust the design itself - e.g. I need to have support struts that are evenly spaced at least 20mm apart but no less than 15mm apart. I can write code that will automatically place the optimum number of supports evenly along any length I enter - and what's more the supports are automatically scaled to the width of the stucture they are supporting. Not much point having an open-source machine if it depends on closed-source tools to build it. RepRaps wouldn't be self-replicating if you needed to buy a SolidWorks/whatever license for each one to be legal, not to mention the ongoing functioning of commercial tools being necessary for the system to operate. The point of open source is that you control what you run, and you know you can always run it, and update it to suit your own purposes. Edited 1 time(s). Last edit at 10/12/2014 04:08AM by polyglot. I'm new at 3d modelling (and in this forum, hello all BTW), and when I've decided that I wanted to 3d model the boxes of some of my eletronic projects I've started searching a tool. I'm mostry an open source entusiast so I needed something that runs on linux (I do own many license of commercial products that run on linux, but I'm not going to use windows at my home pc, sorry I've enough of windows at work). I've tried many 3d modeling tools like freecad and blender, but in the end (mostly like Replace) I'm better at tinking and coding than at interactive 3d modelling. I don't know if there is something that openscad canot do that others software can (or viceversa) and for now I don't care, I just know that I was able to effectively use it about 15 minutes after installing it, so it won my HD! I don't know of anything that OpenScad cannot do that other software can, although some tasks that are built-in with other software need fairly complex coding in OpenScad (e.g. filleting the intersection between curved shapes). The good thing however is that you can make such complex tasks parameter-driven and code them in a module that you can use on any subsequent designs that require the function. There is also a very good chance that someone has already created a library that contains the function - look at the "clockwork" library for example. Libraries are pretty much like plugins that are available for some other CAD software. I don't know of any other CAD software that has a plugin to allow you to create a bespoke escapement mechanism without needing to calculate the required angles and distances etc. I prefer openscad because I'm Computer Programmer. I use it, because I want to know where something is and what dimensions it has. Most 3D GUI based programs kindly hide the dimensions. The only one that is quite usable is Hexagon. However... it's not COBOL !